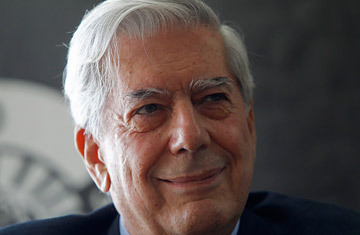 Peruvian writer Mario Vargas Llosa, winner of the 2010 Nobel prize for literature. The love-hate relationship between Peruvian President Alan Garcia and Mario Vargas Llosa, the newly minted winner of the Nobel Prize for literature, is definitely in the love column right now. Garcia gushed with joy early today, when news of Vargas Llosa's win began spreading through Peru. "It is a great day for Peru and an enormous act of justice for Mario Vargas Llosa," he said. In his resignation letter, Vargas Llosa called the law a thinly veiled amnesty and said it was unacceptable in a modern democracy. The author's move embarrassed the government, which then asked Congress to repeal the law, which occured on Sept. 14, with only Giampetri voting against the repeal. The defense minister who wrote the law also resigned. It was not the first time Vargas Llosa was put in charge of a politically charged human rights effort. He headed the government commission that investigated in the 1983 murders of eight journalists in Uchuraccay, Ayacucho. It was also not the first time Vargas Llosa knocked heads with Garcia. In the 1980s (during Garcia's term as head of state from 1985 to 1990), the author took to a break from literature to fight against the President's decision to nationalize the country's banks. After forming a political party, Fredemo, Vargas Llosa was widely expected to win the presidency in 1990. He lost, instead, to an unknown math teacher, Alberto Fujimori, who went on to infamy, first, because of his brutal battle with the Shining Path and, later, as he unsuccessfully fled Peruvian justice and ended in prison. The author went on to become a fierce critic of the Fujimori regime, which ruled Peru for a decade, especially after the govenrment decided in 1992 to shut down Congress. He was a lone voice for years, but his opposition was vindicated when Fujimori's regime collapsed under a massive corruption scandal. Many other illegal activities were also revealed, including the organization of the Grupo Colina, a paramilitary death squad. Fujimori is serving a 25-year prison sentence for being the "intellectual author" of the squad. Peruvians have long believed that Vargas Llosa was passed over annually by the Nobel committee because of his political views. "Mario would have won years ago if he kept his political opinions quiet. His outspokenness was difficult for some to accept," says Genaro Delgado Parker, a prominent local journalist. In 2006, Vargas Llosa and Garcia publicly reconciled their differences after Garcia returned to the presidency, this time as a free-market, economic liberal. Since the author's resignation, the Peruvian President has downplayed the rift over the museum, saying that he picked Vargas Llosa because of his "universal objectivity." Garcia announced earlier this week that a friend of Vargas Llosa friend, the painter Fernando de Syzlo, would head the Memory Museum. He has asked Vargas Llosa to reconsider his resignation from the committee.